I love my little corner of the internet, if I could I would hug it, and squeeze it and never let it go. This little space of mine has become such a creative outlet for me and an opportunity creator to boot. From the people I’ve met to the events and experiences I’ve been lucky enough to have thanks to it. So yeah, thanks blog! However…as much as I love my blog, the last thing I could ever imagine doing is becoming a full-time blogger! Don’t judge, don’t hate, this post isn’t a hate on full-time bloggers - I know a few and they’re amazing, lucky, wonderful people, but here are a few reasons why full-time blogging just isn’t for me, and why it might not be for you too. Events, meet-ups, networking opportunities, they’re all fantastic and I get all the warm fuzzies every time I attend and meet all the amazing people I’ve been chatting to online. Events don’t happen every week, in fact, most are usually during the Spring/Summer, I guess everyone thinks bloggers hibernate come to Autumn/Winter? Ok, I kind of do, but I would make the effort to attend! Let me tell you, blogging can be bloody lonely. As I write this, the only thing keeping me company is a three pack of Reeses and my YouTube subscriptions. Sure, they’re both great in moderation, but if that was my only company 40+ hours a week? I’d be the loneliest little soul! I love me some security. Favourite hoodie, a nice locked door, a cupboard full of tea bags and a guaranteed wage at the end of every month. Every month I know exactly what will be going into my account and I know exactly how much money I can spend on gin and skater dresses. Money isn’t everything, but it does make everything easier. I can be a right stress head sometimes and the thought of having to account for every penny to make sure my WiFi doesn’t get cut off sends shivers down my spine. I feel much safer knowing if I take a day off, or I’m sick and have to spend the day in bed, my wages won’t suffer. If I can’t work, I’m still ok. The thought of crapping out content just so I can have a few days away from the keyboard doesn’t sound like fun at all . I have spent years trying to fight off procrastination. Most days I give in and blink before procrastination does. Before I know it several hours, an entire season of Billions and half a box of Jaffa Cakes have gone by and I’ve yet to write a single blog post. Sometimes it’s just that easy. I go through the motions, the guilt, the sadness, the anger, the must-type-frantically-for-an-hour-before-bed to make myself feel better, only to churn out utter tripe at the end of it and not even hit the save button. It happens. And I’ve learnt to be OK with it. Because my livelihood, my electricity bill and my addiction to eating out don’t depend on me posting. You might as well chop off the most unnecessary hand and replace it with your smartphone. When blogging becomes your business, you become the brand. Your home becomes your office - is there ever an escape? Even now, as someone who blogs for fun, I sometimes start panicking I’m going to lose all my followers if I haven’t tweeted in a couple of hours, or haven’t snapped my lunch to Instagram - and that’s just part of a hobby, imagine if it was my job too? I like having the freedom to snap when I want, pick and choose the chats I take part in, be an active part of the community when it suits, and a hermit when I just want to Netflix and chill. Like I said, I love my blog. It’s full of content that I have loved creating, things I am passionate about and want to share with you all. I would never write about something I wouldn’t spend my own money on, and if I’ve not got anything nice to say? Then I’ll tell it like it is and say something not so nice, and nobody can stop me. I can be 110% honest here in my little corner, I don’t have to worry about upsetting anyone, I don’t have to conform to anyone else's do-follow link rules with x amount of keywords in a post if I don’t want to. I have total control and free reign. I would love to be able to spend more time on my blog, and if I could work a little less and blog a little more, I would do it in a heartbeat, but giving up the day job for blogging just isn’t on the cards for me. Maybe things will change? I’ve seen so many people lately talking about how they just want to blog full time because yanno Zoella makes it look like so much fun. In reality, it really doesn’t sound like it’s that much fun all of the time! I would love to take my blog to the full-time level more than anything in the world but I agree with you on the question of a steady income at the end of the each month while with blogging that one can be pretty tricky. Well said! I wouldn't want to be a full time blogger either. I kind of envy those who are but at the same time I value my "day job" and the security it brings! I do and I don't. I honestly think I'd never get bored. Or lonely. I'd happily see less of people. It's just not having a stable income that scares me. 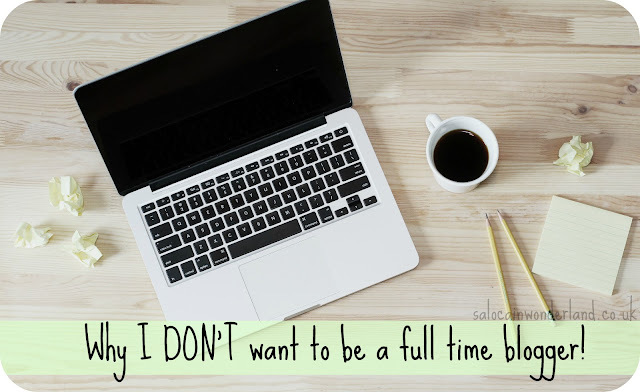 I don't think I could do a 9-5 job - I want to work for myself (preferably on my blog) and have the freedom that comes withome being my own boss. That said, you make a great point point about not having a stable salary. Maybe doing a part-time job would work? Thanks for sharing Sarah! I would love to make a little something from my blog, if only to fund the blog itself, i.e use it for products to test or places to go to and then write about. But I love the hobby side of things and how I can pick it up and drop it whenever I like!